News Regarding HSH Prince Albert II of Monaco. 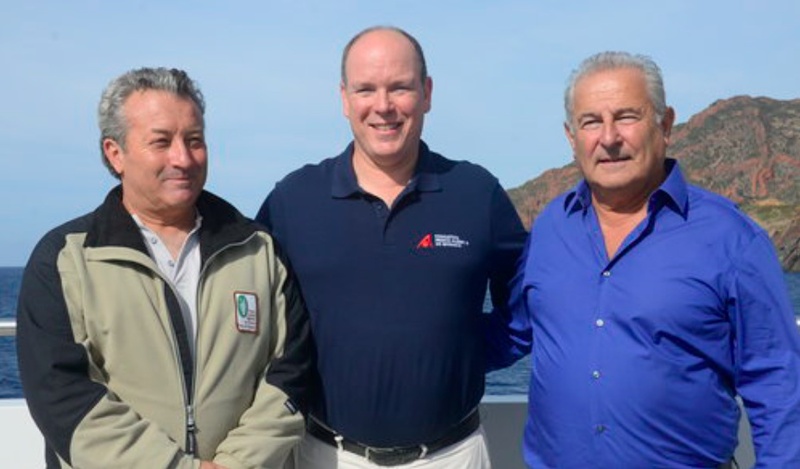 On Tuesday, September 22, 2015, His Serene Highness Prince Albert II of Monaco witnessed the signature of convention between the Fondation Prince Albert II de Monaco and the Corsican Scandola Nature Reserve aboard the yacht, Yersin, off the coast of the island of Corsica. The agreement sealed the deal for the financing of surveillance camera system on the Corsican Scandola Nature Reserve. And, finally, on September 24, 2015, the sovereign prince received a check — to be donated to the Fondation Prince Albert II de Monaco — worth €46,000 from the Director General of the Monaco Yacht Show, Ms. Gaëlle Tallarida, and from the CEO of Informa Group, Mr. Stephan Carter. “…its action to combat deforestation and its Wood Forever Pact program. The Wood Forever Pact network has made a commitment to use and promote timber harvested from sustainably managed forests. The Prince Albert II of Monaco Foundation has been committed to fighting deforestation since its creation. The preservation of the tropical rain forests enables action to be taken in the Foundation’s three priority focus areas: fight against climate change, protection of biodiversity and access to water. After an extensive study concerning the various environmental issues generated by the yachting sector, the Foundation chose to focus its action on wood, a key component in yacht construction. The various types of wood found aboard are selected for their technical, mechanical and aesthetic qualities. Teak, mahogany, ebony… these tropical woods are used for decks and exterior fittings, as well as for the interior decor and furniture. In 2010, the Prince Albert II of Monaco Foundation launched the Wood Forever Pact with the aim of helping yacht builders with an approach to use timber harvested from sustainably managed forests. The Monaco Yacht Show, due to its status as a key international yacht show and its objective to combine luxury with respect for the environment, quite naturally decided to team up with the Foundation. Previous (VIDEO) HM King Willem-Alexander of the Netherlands Opens a Distribution Center. Next His Majesty King Philippe of Belgium Opens Train World.